C. P. Goerz was founded in 1886 by Carl Paul Goerz (1854-1923), a salesman who once had been in apprenticeship at Emil Busch in Rathenow and later was partner of Eugen Krauss in Paris. Originally Goerz sold mathematical tools for schools, since 1887 also cameras. By taking over F. A. Hintze's workshop in 1888 his company became a camera maker itself, named Optische Anstalt C. P. Goerz since 1890. It was based in Berlin-Friedenau. In 1888 Goerz employed the engineer Carl Moser (1858-1892) and the optician Karl Hertel to start the development of lenses. 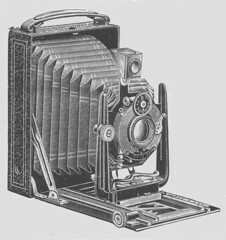 Goerz is known primarily for Anschütz cameras, for Doppel-Anastigmat, Hypergon, Artar, Pantar, Tenaxiar, Tenastigmat, Hypar, Hycon, Certar, Gotar, Frontar, Dialyt, Syntor, Celor, Kalostigmat, Paraplanat, Choroskop, Lynkeioskop, Dogmar and the legendary Dagor camera lenses , and for Tengor and Tenax cameras, later continued by Zeiss Ikon. A specialty of Goerz were the cameras with "rouleau-shutter" since the company had the exclusive right to produce the fast focal plane shutter (1/1000sec.) that Ottomar Anschütz (1846-1907) had invented in 1883. These were mainly, but not exclusively, strut folding cameras, known as Ottomar Anschütz or Goerz Anschütz cameras, and many branded Ango as word derivation for Anschütz and Goerz. The first one was the Goerz-Anschütz Moment-Apparat of 1890, a box camera for 9x12cm plates with a good lens mounted on the front plate. Other products of Goerz were meteorological and aeronautical instruments, binoculars and Alethar repro lenses, gun scopes and another camera shutter, the Sector shutter. In 1903 it founded a department for military optics which became the world's largest military optics maker. Another big success was the making of scientific telescopes. A telescope for viewing a total eclipse and a 3-color-projector was made for the famous Dr. Adolf Miethe. In 1895 Goerz founded a branch in New York that started own production in 1902 and was to become the C. P. Goerz American Optical Co. in 1905. This company continued to operate independently in the US until 1972. Until WWI many great companies cooperated with Goerz. Rochester Optical Co. used Goerz lenses for its Snappa Camera in 1902, Kodak for its No. 3 Folding Pocket Kodak in 1901, and Ross in London got a license to make Dagor double anastigmat lenses already in 1893. In 1903 Goerz became a stock market company. In 1908, Goerz Photochemisches Werk GmbH was founded in Berlin-Zehlendorf. This company produced roll film and film for the movie industry. In 1910 Goerz became owner of the Sendlinger Optische Glaswerke, an optical glass maker near Munich. At that time the company had further factories in Berlin-Friedenau, Vienna, Pressburg (=Bratislava), New York and Winterstein. It had offices in Berlin-Friedenau, Paris, London and New York. During the First World War, Goerz's main production was making optical instruments for the German and Austrian military, but started also making electrical search lights. After the war further making of military equipment was forbidden by the Peace Treaty of Versailles. The company tried to make mechanical calculators and other scientific instruments instead but failed to regain former success. In 1926 the German branch of Goerz was saved from bankruptcy by being merged with ICA, Contessa-Nettel and Ernemann to form Zeiss Ikon. This had major consequences for the company; the Carl Zeiss company held a majority stake in the new company and demanded that the other firms end their lens production. This was the end of the famed Dagor lenses, at least in Europe. An Austrian branch of C. P. Goerz was still active in the 1950s, introducing an astonishing little subminiature reflex camera with 6 element Helgor lens, the Minicord.